At Kaizenprint we believe that design is just as important as print. As well as offering an outstanding high-quality in-house design service, we want to help you get the most out of your individual design work. 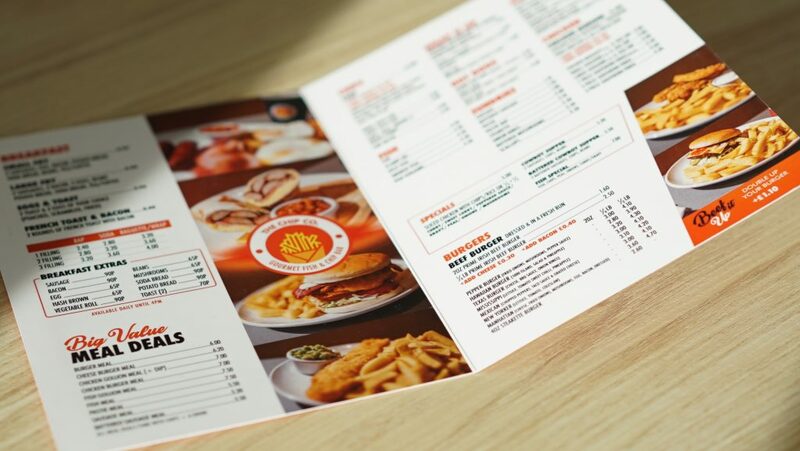 Our talented graphic design team have created countless menus, some of which can be seen here for some inspiration: https://kaizenprint.co.uk/design/. Crucial factors to be considered when designing a menu are the readability and visual nature. Certain elements incorporated into a menu can help to draw diner’s eyes to certain areas and, in turn, increase sales! Below are some tips on creating your own menu. The relationship between marketing and psychology has been talked about for years. Many designs have been created to make consumers feel a certain way. This could be an emotion evoked by colour or any other element that pushes the power of persuasion. So, how can designers tap into this? A menu has a short time scale in which it needs to create an impact. Diners tend to spend an average of 109 seconds reviewing the menu before making a decision. A menu can make an instant impact via clear section headings, by using clear and powerful typography and by placing images strategically. Where an item on a menu is located can significantly impact the saleability. Do you know where people’s eyes are drawn to first? Menu scanners hop to items under large headings. The top centre of a menu is a prime position regardless of the menu format. Using a box or a frame to highlight certain items on the menu is a common theme. However, this can be taken a step further by showcasing visuals alongside the more premium menu items. Combine this tactic with prime placement and you have the perfect recipe to increase the chances of your customers ordering the most expensive items on the menu. Bold and readable are the key factors to consider when deciding on your typography. Why not try using a novelty or script typeface for the food item names, and use something standard for the descriptions. We also suggest that you use bold and italics strategically to draw attention to certain items – what is the restaurant known for? What are the specials? When designing your menu it is vital to consider the overall branding of the establishment and the style of food you offer. Novelty styles could be used for a relaxed burger bar or dessert café. Colour has the ability to impact how a reader feels when reading through the menu. You will not only need to select colours that suit the brand’s personality but also colours that evoke feelings or emotions you would like your customers to experience. If we look at the psychology of colour, it can help to decipher what may work best for a specific menu. Have you ever been to a restaurant where they have used a stock photo image for each item on the menu? Yup, us too! More often than not, it arrives nothing like the dish you had spent minutes fantasising about. At Kaizenprint, we believe that photos should be used sparingly when designing a menu. And, if images are used, they should represent how the food will look when it arrives – so it’s a good idea to hire a professional photographer to get this right. Using too many images is associated with cheaper restaurants, whilst high-class restaurants will tend to avoid images altogether, and instead opt for beautiful typography or illustrations. Menus with items that include an appealing description can see sales rise considerably. Utilise sensory descriptions like “succulent”, “zesty” and “tender” to entice your customer’s palettes. Similarly, descriptions that evoke nostalgia can increase sales. Words such as “homemade” and “traditional” have the ability to achieve this. Creating a menu can be can fun and exciting! But it also incorporates numerous strategic design decisions that can leave you feeling overwhelmed. As always, feel free to contact us here at Kaizenprint. Our friendly in-house design team will be happy to answer any questions you have regarding your own design project. Contact the Design team now on 028 9002 2474. This entry was posted in Design and tagged Design, Design Tips.